Our esteemed consultants Ahmed Aboulnaga (@Ahmed_Aboulnaga) and Harold Dost (@hdost) presented Oracle WebLogic Server: Remote Monitoring and Management at last night's monthly SEMOP meeting. 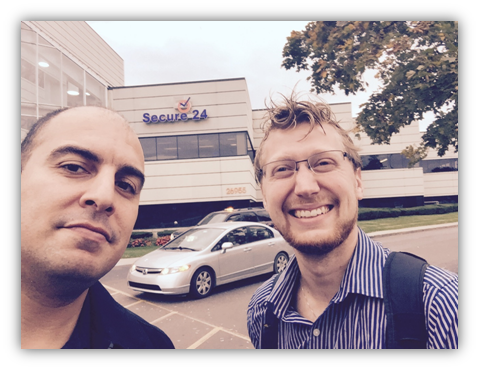 The South East Michigan Oracle Professionals (SEMOP) meets once a month in Livonia, Michigan, and venue and catering is sponsored by Secure-24. The presentation revolved around Oracle WebLogic Server 12c monitoring and management and discussed topics such as OEM and RESTful Management Services, which allows anyone to query and monitor numerous Oracle WebLogic Server metrics from a multitude of programming languages, including mobiles devices. 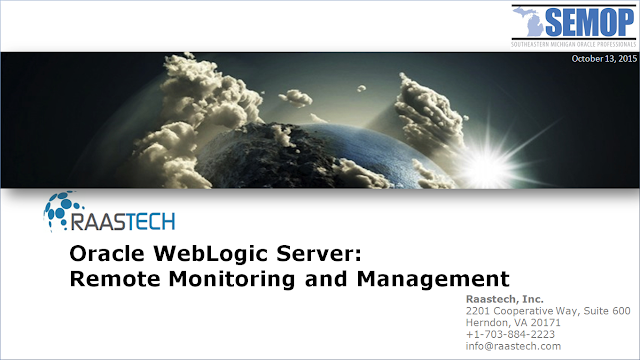 Ahmed and Harold also introduce a tool that Raastech has developed that supports mobile monitoring, management, and alerting of Oracle WebLogic Server and shared the architecture and design with our SEMOP colleagues. The presentation can be downloaded from SlideShare. What you find here, most likely you won't find elsewhere. The Raastech Blog has unique posts that are meant to share our experiences, provide resolutions to both simple and complex problems, and share our technical knowledge with the community. We focus on Oracle Fusion Middleware technologies such as Oracle SOA Suite, Oracle Application Integration Architecture (AIA), Oracle Data Integrator (ODI), Oracle WebLogic Server, Oracle Web Services Manager (OWSM), Oracle Service Bus (OSB), WebCenter, and more.